She thought he made all the necessary changes: quit his job (because they had worked together), cut off all contact with her and promised to never do it again. Then three years ago, she found out the communication and the lies were occurring again with the same woman. And he promised again. This would be the end of his lying and betrayal. Until recently when she found out the relationship between her husband and this woman still hasn’t ended. He’s brought her to their home, he’s traveled to different cities to meet her, he’s calling it an addiction and asking for help. Now Tammy sits here ten years later stuck in the same recurring heartbreak, the same cycle of pain, caught in the same web of the same lies…over and over. It would be easy for us to sit on the sidelines of Tammy’s relationship and wonder how she got to this point and why she stayed as long as she did. 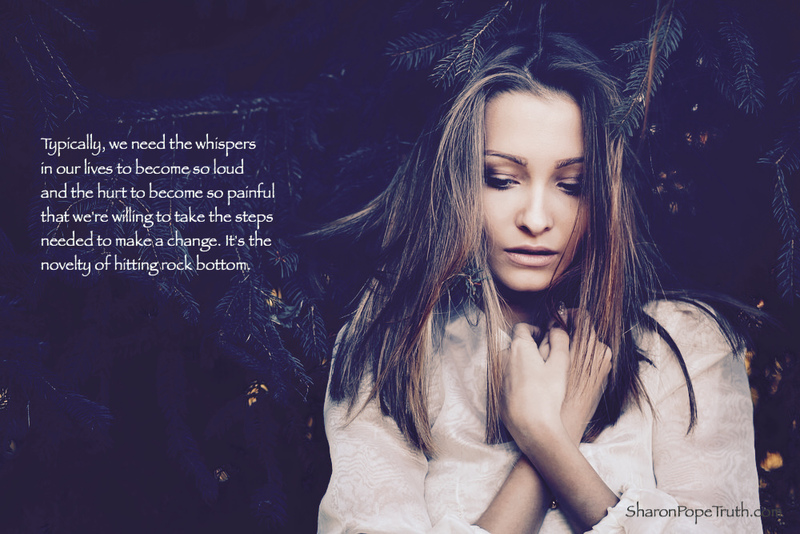 Typically, we need the whispers in our lives to become so loud and the hurt to become so painful that we’re willing to take the steps needed to make a change; it’s the novelty of hitting rock bottom. It’s only when our lives become unbearable that we take the scary action and make the necessary changes in our lives and in our most important relationships. When we’re in pain, we’re highly motivated to find a different way. That place where there was no more anger, but rather a deep sadness. She had no more fight left in her. That place where she was willing to face all the fears of moving through a divorce and creating a new life for herself – even if it mean being alone for a while. That place where she finally knew deep in her soul that this wasn’t how love was supposed to feel. She was finally and completely done. How would they tell the kids (who weren’t kids anymore now but would still be surprised)? How would they explain it to family and friends? How would she keep her peace when things got ugly? Did things have to get ugly? I wrote my most recently published book for Tammy, I Know It’s Over. Now What? I, of course, didn’t know it at the time because I didn’t know Tammy and I didn’t know her story. But each day I speak to women when they realize – just like Tammy – they’re finally and completely done. But everything on the other side of that decision is unknown. I Know It’s Over. Now What? gently guides you through all those unknowns and helps you use this experience as a catalyst for growth rather than a death sentence of years in misery.